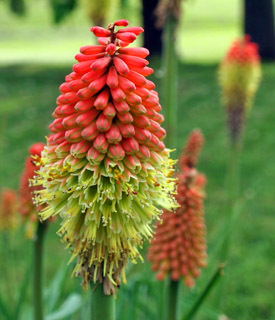 Flaming Torch Lilies, officially called Kniphofia, are a unique and spectacular plant. I have always like the name "Flaming Arrows" since the name is quite fitting. They fill the garden with large, colorful blossoms that is the plant world's version of a flaming arrow. These are really awesome plants that I have only great things to say about. Most flaming torch varieties are really hardy plants. The one in the photo is well over 20 years old! It is a perennial that can survive high heat, extreme drought, deep snow and most anything that nature can throw at it. Long after many other perennials have perished over time and due to extremes, this plant remains the same year after year. The spring foliage looks like any number of other lily plants until the flowers appear. In late spring the beautiful red flowers quickly appear atop the sturdy stalks. The blossoms begin opening from the buttom up, which helps give the plant the flaming arrow look. The flowers attract bees and birds and other insects. If you are interested in attracting butterflies and hummingbirds then this is a good choice. The stalks are not dainty, but are a half to three quarters of an inch in diameter. In my opinion, the stalks and flowers are too large to use in most flower arrangements unless the arrangements are quite large. However, if you could use them they would look amazing. 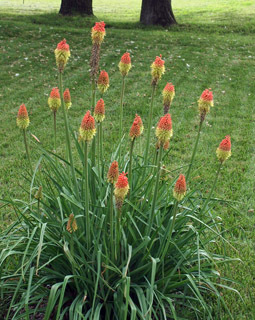 Flaming Torches are hardy perennials that come back every year. Some recommend the plant be covered with straw to protect it in winter. I have never done anything to protect this plant in winter with no damage, whether it is 16 inches of snow, 10 below zero temps or heavy ice and even severe drought that killed many other plants. Nothing seems to harm this plant. However, if you are concerned, it will not hurt to cover them. Lastly, this plant seems to be free from disease and insect pests. I have never seen any disease symptoms in all the years we have had it. Longevity: Long-lived perennial. Mine are over 15 years old. I don't know the maximum age they can reach. Flowers: Flowers may be red, orange, shades of green and yellow. Soil Conditions: Flaming Torches do best when planted in well drained soil. Soils should contain plenty of organic matter, such as compost, etc. Bulbs should be planted 3 - 4 inches deep. Bloom Time: Flowers appear in late spring. You can deadhead spent flowers to help keep the plant blooming most of the summer. Stems: Stems can grow upwards three to four feet and the flowering tips can be six to eight inches tall. The base of the plant in the picture is over two feet wide. Exposure: Plants prefer full sun. The can tolerate partial shade. Fertilization: Fertilize once a month when blooms are present to help promote maximum color and blossoms. Important Notes: Different varieties produce very different flowers from the traditional torch to bell flowers. Be sure to research the flowers before buying. Cautions: Do not plant is ground where standing water remains after raining. The plant's primary weakness is that it can't take overly saturated or flooded soil.